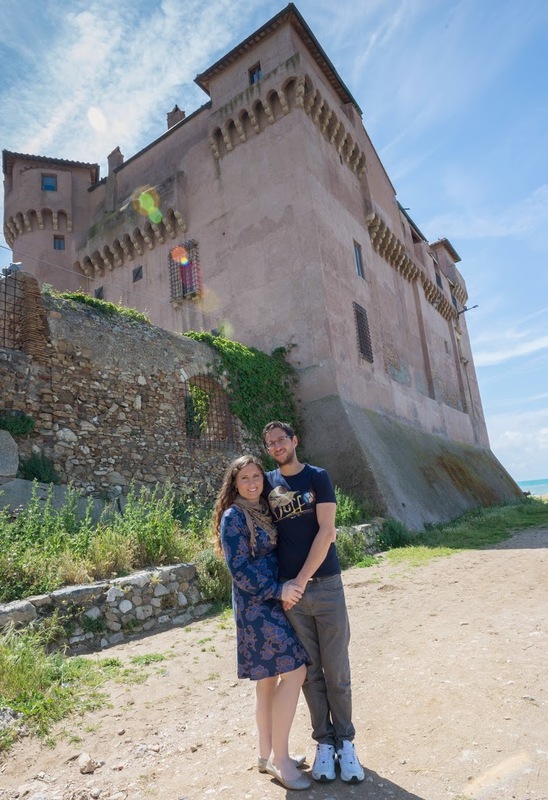 Yesterday (actually yesterday, not uploading months old posts for once), Daniele and I visited the Castle of Santa Severa. 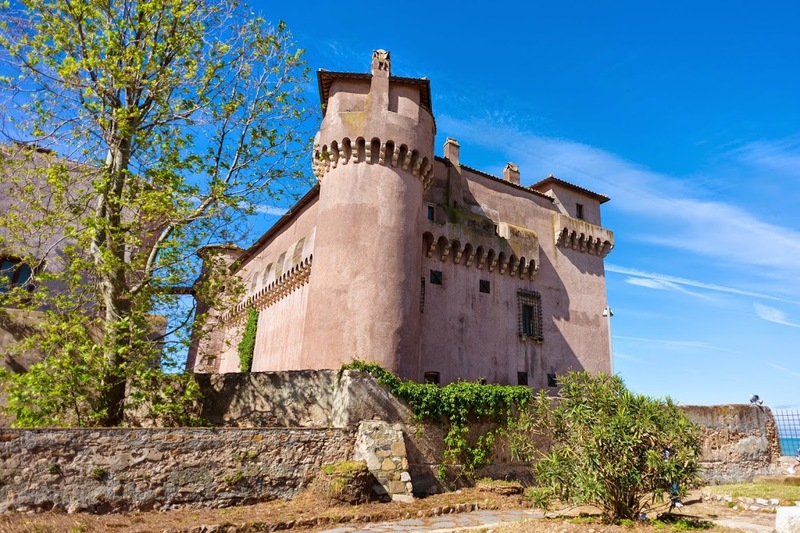 The castle has changed hands many times, and now the town of Santa Severa* owns it and opened it for the week, by appointment, to see about making it into an open tourist attraction. *Note, Santa Severa is not a town or “commune” in its own right. It is a “frazione” or borough of Santa Marinella, composed of a few grouped together houses. A clear distinction in Italy where every “commune” has certain amenities (the town hall, police station, train and/or bus station, post office, church, and almost certainly a bar, pizzeria, and tabacchi) and always a town center where you find most of these. In true Italian style, the castle is a mix of structures all build on top of each other. The oldest date from 5th to 4th millennium B.C. — that’s millennium, not a typo. The location leads to people wanting to live there. The castle sits on its own micro-peninsula sticking out into the sea, with sandy beaches to the right, and rocks that were probably placed there to slow erosion to the left. Our guide said that they estimate the land used to stick out another mile, because they have found remnants that far out. It is easy to understand erosion being a concern for any sea-front castle owner. The history of the castle is not very clear since it dates to prehistoric times. The consensus is that the area was frequented dating back to 5th to 4th millennium B.C. There are excavations dating from the Neolithic Period (7th to 6th millennium B.C. ), the Bronze Age (2 millennium B.C. ), and the Iron Age (9th to 8th century B.C.). We know a little more about the Etruscan Period. The Etruscans were a civilization based in Tuscany from 7th to 6th century B.C. that evolved along with and were later conquered by the Ancient Romans. 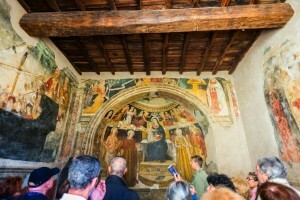 I first learned about them during my Volterra visit in 2010. In Etruscan times, the place was called Pyrgi and served as a commercial port connecting to all of the Mediterranean, especially Greece and Phoenicia. This Etruscan port mostly supported (and vice-versa) the nearby city of Caere, modern day Cerveteri. A very ancient sanctuary with temples to Apollo and a few other deities was also found outside of the residential area, which spread about 25 acres. Some important relics were found here, one of which is three tablets written in both Etruscan and Punic, proving the strong relationship between the Etruscans of Ceveteri and Cartharage. Romans dominated the area beginning in 3rd century B.C. Pyrgi became a maritime colony and a huge rectangular fortress was built, surrounded by polygonal wall. These were built on top of the Etruscan and prehistoric structures. This fortress continued to be used until 5th to 6th century A.D. (the Late-Ancient Period). It is believed that the structure was transformed to an important villa by this time. Also in the Late-Ancient Period, an early Christian church was build next to the port dedicated to Santa Severa. Santa Severa was a Pygrese martyr in the third century A.D. This early Christian church was only just discovered in excavations in 2007. Santa Severa continued to develop on top of the older structures. During the Medieval and Renaissance periods, the village occupied only a quarter of the Roman fortress and had become a huge farming estate as well as a stopover port between Rome and Civitivechia (today where most cruse ships come in to visit Rome). All of this history and building on top of things lead to a piecemeal fortress-style castle, not a palace like Versailles by any means. I kept low expectations of a pretty simple stone structure going in, and I was pleasantly surprised by what we found. There is a very castle-like Keep in the center, with towers and battlements. 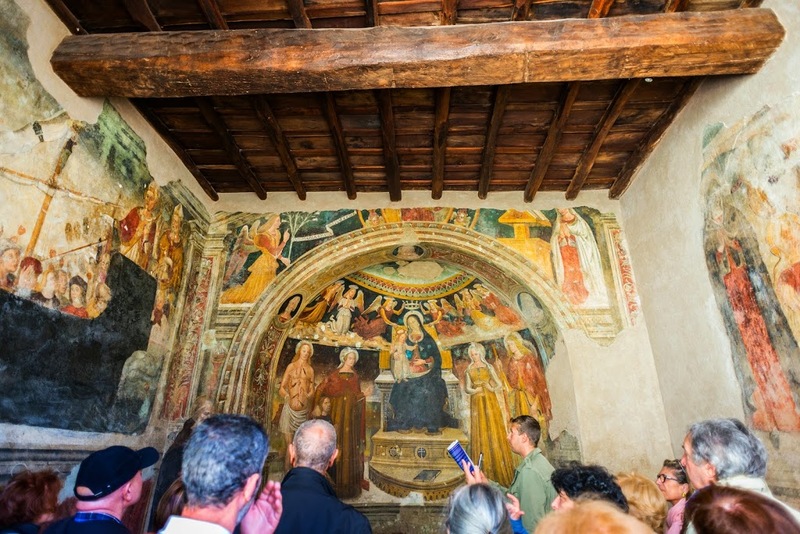 There are also impressive frescoes in the two “newer” churches and dug out excavations of the oldest church– an early christian structure build on the remains of an Ancient Roman villa, a grain refinery turned graveyard with evidence of grave robbing, and a secret stairway with direct access to the beach. The whole structure reminded me very much of all of the medieval hill towns here in Lazio that we frequently visit. Which makes sense, since ancient castles were basically walled-in towns. The main difference here being that this entire structure, which could be a small town, has been in the ownership of a single body since at least Ancient Roman times. Now that the castle is in the hands of the town, the idea is to open it to the public. This week was a bit of an experiment along those lines. I’m not sure about the time-line on those goals or if the idea is to just open it up or keep the guided tour structure. There are already some shops in one of the three courtyards before passing the door where our tour began. We were told no one is allowed past that door unaccompanied. And I’m not sure if I would have enjoyed all of the sites within without our guide, who lucky for me spoke very clear Italian. He was one of the archeologists involved in the actual excavation of Castle Santa Severa and was able to point out all of the cool little things that I would have missed without him. You can follow along our tour with my heavily captioned photos. We rounded off the day with lunch on the beach in front of the castle. We stayed on the rocky side since the sandy part looked a bit damp. The beach here has been open to the public and a popular spot all along. In fact it had been on our list of beaches to try out for quite some time before Daniele heard about the castle opening. After, we finished with a visit to the neighboring town of Santa Marinella before it started to rain and we headed home. I just want to say I am all new to blogs and absolutely loved you’re blog site. Almost certainly I’m want to bookmark your website . You absolutely have impressive articles and reviews. Kudos for sharing your blog site. May I simply just say what a relief to find a person that really understands what they are talking about on the net. You definitely understand how to bring a problem to light and make it important. More and more people ought to read this and understand this side of the story. I was surprised you’re not more popular since you most certainly possess the gift. We merely intend to notify you the fact that I am certain inexperienced to writing a blog and very much valued your page. Most likely I am likely to store your article post . You absolutely have impressive article stuff. Appreciate it for share-out with us your domain document. Seriously stimulating points that you have mentioned, thanks for setting up. I simply intend to reveal to you which I am raw to posting and clearly admired your report. More than likely I am likely to store your article post . You really have extraordinary article writing. Appreciate it for giving out with us your internet site article. hey there and thank you for your info – I have certainly picked up anything new from right here. I did however expertise a few technical issues using this website, since I experienced to reload the website a lot of times previous to I could get it to load properly. I had been wondering if your web host is OK? Not that I’m complaining, but sluggish loading instances times will sometimes affect your placement in google and can damage your quality score if advertising and marketing with Adwords. Well I’m adding this RSS to my email and could look out for a lot more of your respective interesting content. Make sure you update this again very soon.. I merely intend to notify you which I’m really novice to online blogging and totally valued your website. Very likely I am most likely to bookmark your web post . You indeed have outstanding article subject. Value it for discussing with us your internet article. Great post. I was checking continuously this blog and I’m impressed! Very helpful info specifically the last part :) I care for such information much. I was seeking this particular info for a very long time. Thank you and best of luck.